It’s hard to believe that Paul Carter has been gone ten years. I realized that my original ZX Spectrum BASIC memorial to him had got a bit dusty, in that it ran as an outdated Java applet. 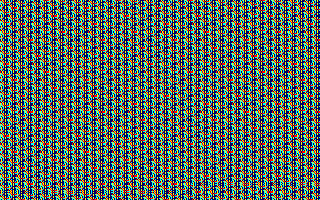 So I rewrote the code, and put it here: All the Colours We Have (for Paul Carter). You have no idea how good it was to see that message come through over the serial link. The Zeta worked first time! 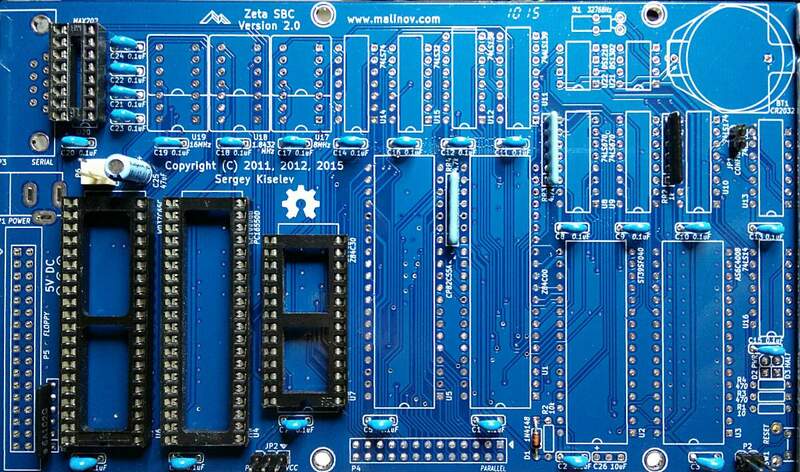 Author scrussPosted on 02015-07-25 Categories computers suckTags sbc, z80, zetaLeave a comment on Zeta: it lives! This adds the crystal sockets, the 32.768 kHz RTC crystal, the status LED(s) and the reset button. Man, but those surface mount SD card pads are a pain. I had to get flux on the PCB pad and the bottom of the SD connector, load a little blob of solder on the iron, then warm up the pad and roll the solder into place. It made a satisfying little Zsht! noise as the flux burnt off, and the molten solder got drawn under the pad by capillary action. Next up is checking the power and ground continuity, adding the chips, building a null modem (grr; I hate RS232, really) and finding a case. I may already have one, but I may forage at Above All to get a 3½” floppy drive and enclosure. I definitely have an old Turbo/reset button from an XT that would make a great reset breakout. Author scrussPosted on 02015-07-24 Categories computers suckTags sbc, z80, zetaLeave a comment on Zeta: all soldering done! 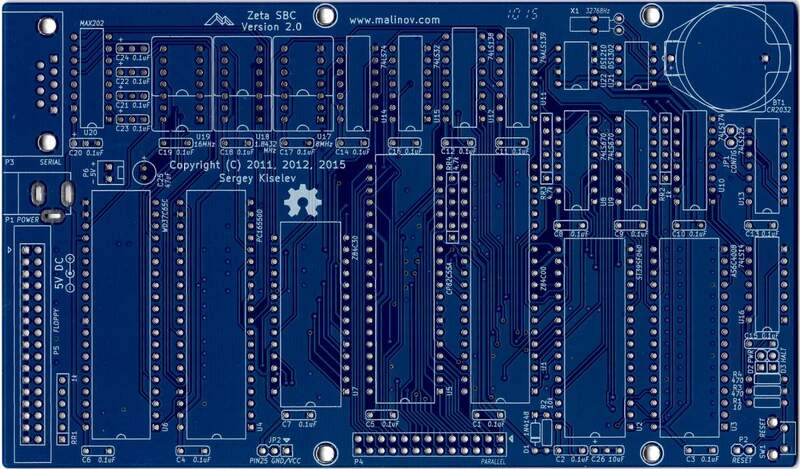 Just waiting for the full-can oscillator sockets (and most of the chips) to arrive from Mouser. 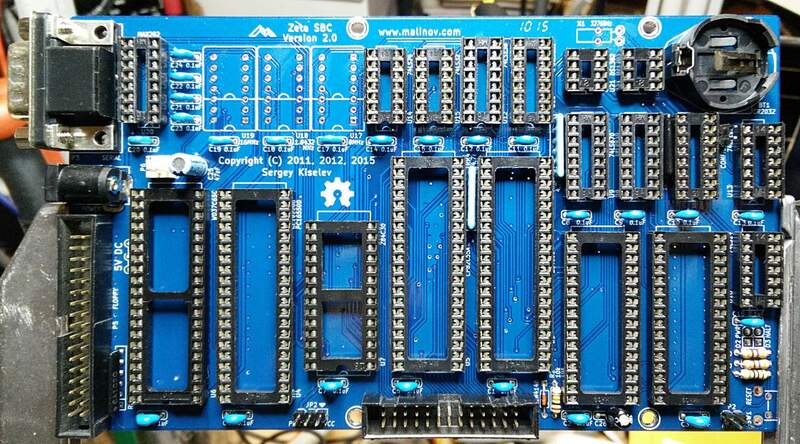 I could have used 14-pin DIP machine pin sockets, as Sergey was thoughtful and had all of the holes drilled. Most of the big sockets need to be fully soldered, as at the moment they’re just tack-soldered at the corners. Maybe I’ll put on some dronecore and have a meditative time with the Sn-Ag tonight. I’ll be glad to get the flux off the board, though: it’s not my usual stuff (which is Kester #951; no clean ftw), and what I’m using is smoky and a bit gummy. It does make nice bright joints, though, which is never 951’s strong point. That’s all but one of the capacitors in. The big chip sockets are soothing to solder. 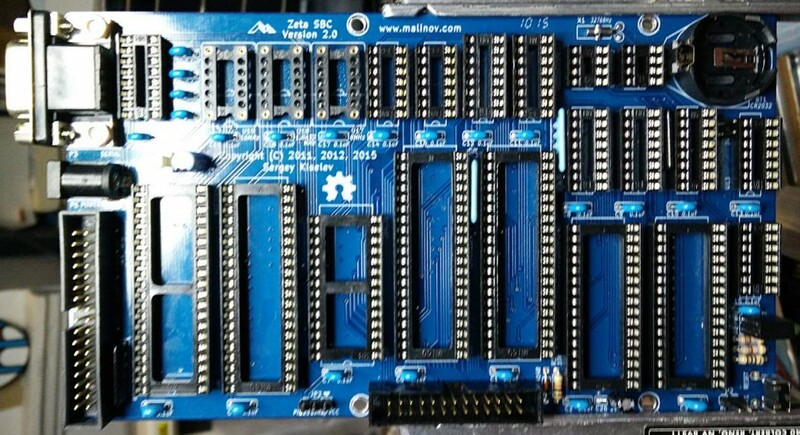 I’m building a Zeta SBC V2, a basic Z80 computer in the spirit of the N8VEM. I’m trying to kit it out mostly locally, which means extensive trips to Creatron, Supremetronics/Honson Computer (aka the basement of College Home Hardware), Above All Electronic Surplus, and Active Surplus. Fun discovery #1: not all CR-2032 battery holders are the same size. 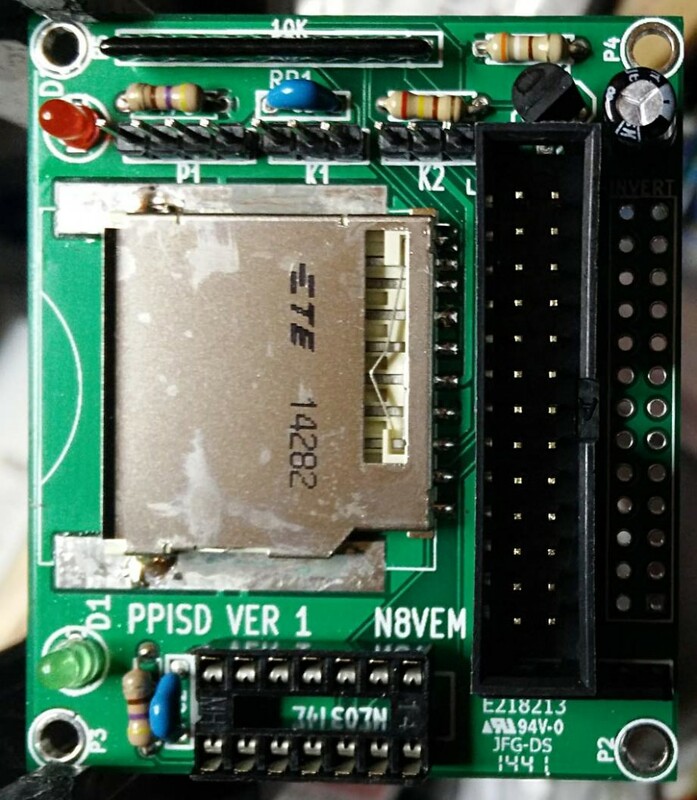 This board call for the one just a tiny bit larger than the coin cell itself. Most of the ones with the retainer clip that goes over the battery are too big, and will prevent other components being installed. 2D Star Dodge flies again! There’s rather more nostalgia in this post than I’d want to deal with. If you want to just play the game, go here here and skip this blurb. About 25 years ago, I was a smallish computer nerd obsessed with programming his Amstrad CPC464. I had got a BCPL rom-based compiler for cheap and was looking for things to do with it. “Why not write a game?” I asked myself. There were two minor hurdles. I had no imagination, and I certainly wasn’t focused enough to write anything big. Fortunately, it was still the 80s, so we knew how to rip stuff off without being called out for it. 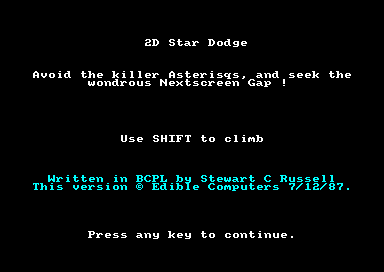 I merrily copied a game my friend Alan Cook had written for the Dragon 32, and called it 2D Star Dodge. 2D Star Dodge was the perfect rip off. Not merely had I ripped off the idea from Alan, but he had ripped off the idea in turn from a BBC Basic one-liner game called (as verified by Graeme Smith) “One Line” Asterisk Tracker. 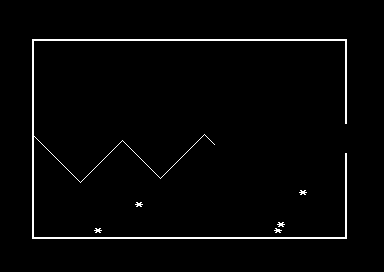 The name 2D Star Dodge was an, um, homage to Realtime Games’ 3D Starstrike, which itself was “strongly influenced” by the Star Wars arcade game. Originality? Pfft. 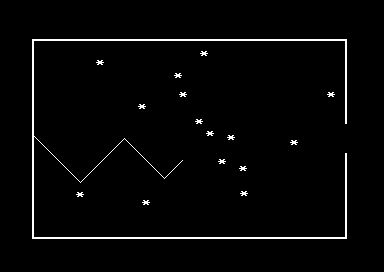 The gameplay — press a key to go up, stop pressing a key to go down — is a bit like SFCave (obligatory Java version: Lab6 SFCave) or even my current favourite Tiny Wings. 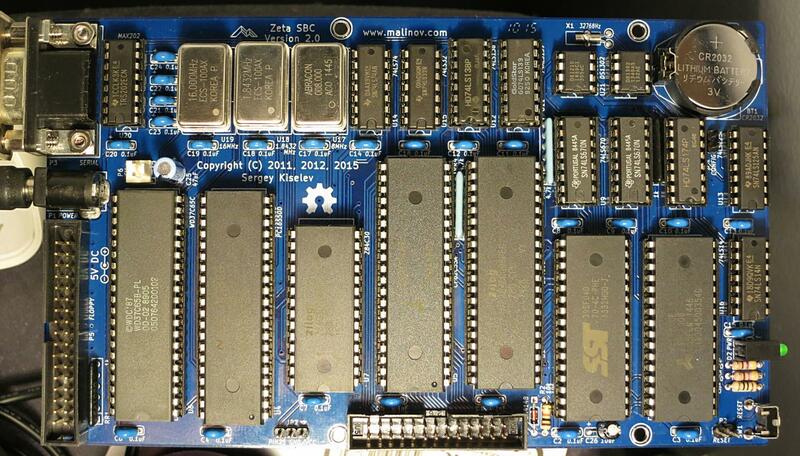 Once I’d finished the BCPL version, I had bought the MAXAM assembler ROM, and got learning the Z80 opcodes. Soon, a third port was complete, now needing hardcoded delays to be playable as it would kill you off in about one screen refresh without them. So, now I had three versions of the same game. There was only a limited number of local folks I could give it to, so I decided to send all three versions to Amstrad Computer User magazine to print as a type-in. Thankfully, it arrived on the desk of the freshly minted (yet still beardy) assistant editor Jeff Walker, who had founded the jam econo CPC magazine/club WACCI. Jeff had the idea for me to turn the simple game into a comparison of programming in three languages. To run the BASIC version, type run"stardoj2 (on my American keyboard, that becomes run@stqrdoj2; quotes are Shift+2). Hitting Escape twice will quit back to the prompt. 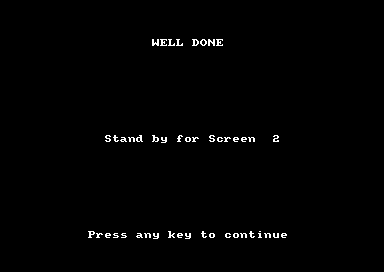 To run the BCPL version, type run"2dstardo. 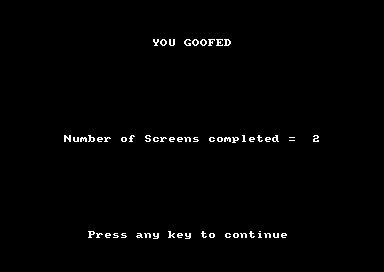 The only way to quit is to reset the emulator. The BASIC version is based on the published type-in. The BCPL version I found as a disk image (2dstardo.dsk) on a download site — it’s exactly as I submitted it to the magazine, dubious copyright message and all. I’m not sure how it got out there; I suspect either my network of, ahem, software protection experts I knew through Colin Harris of Nemesis, or it went via my CPC-owning French penpal (Hi Benoit Hébert, formerly of Le Havre). I had to modify the BCPL binary to run on modern emulators, as the real Amstrad CPC did a thing with its keymapping that is really hard to get right on modern systems. Originally, the game used the Shift key, but I modified it to use Space, which is easier to emulate as it’s a printing character. Can I just say that I remembered how to read and modify Z80 binaries after a quarter century? Old school, literally. I used iDsk‘s disassembler/hex dumper and emacs’s hexl mode to do the deed. I recently discovered that someone created a Flash game based on my type-in: Star Dodger. Mind = Blown. Update, 2018: Lawks! Someone wrote a PureScript version! It doesn’t exactly work for me on Firefox, but it does on Chromium. Author scrussPosted on 02012-09-08 02018-07-05 Categories computers suckTags 2dstardodge, amstrad, basic, bcpl, cpc, emulation, game, z8010 Comments on 2D Star Dodge flies again!